About Us - LUBBOCK MEMORIAL ARBORETUM ...A LIVING TRIBUTE TO EVERYTHING THAT IS BEAUTIFUL! The Arboretum was begun with an idea spearheaded by Mrs. Nat (Georgia) Williams, President of the Lubbock Council of Garden Clubs (1954-61). Under the auspices of the Lubbock Council of Garden Clubs, Robert Rucker, ASLA was hired to do a Master Plan for the 93 acre Arboretum located around the Garden and Arts Center in the K.N. Clapp Park on University Avenue. Mr. Rucker was a Landscape Architect from Norman, Oklahoma and formally an Associate Professor at Texas Tech University. Work started in May of 1961 with the planting of the first tree, which was a pecan planted by the Junior Buds, a youth club sponsored by the Bud to Blossom Garden club, on Arbor day, January 20, 1962. The tree is still thriving 49 years later. 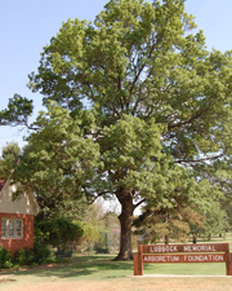 For tax and grant purposes, the Arboretum was incorporated as the Lubbock Memorial Arboretum Foundation, Inc. on June 4, 1964. A Board of Directors was established and contract signed with the City of Lubbock Parks Department to plan and manage the Arboretum. The Park Department is responsible for the majority of the Arboretum maintenance such as mowing, watering and tree pruning, etc. The Arboretum Foundation supplies the cost of all trees, ornamental plantings and garden renovations. With the help of a lot of individual volunteers and service organizations, the Arboretum also contributes substantial labor to the upkeep and care of the gardens in this park. Many of the Gardens and Tree plantings were honorariums or memorials for individuals or special events. The Arboretum was established as an educational tool to prove which trees and ornamental plants could be introduced into West Texas and the South Plains. Many plants did not survive for various reasons, however the beautiful seasonal color and the mature trees surrounding the Garden and Arts Center and throughout the K.N. Clapp Park prove that failure of some plants is not a reason to quit trying new plants. It is and will continue to be the goal of the Arboretum to HELP KEEP LUBBOCK BEAUTIFUL.